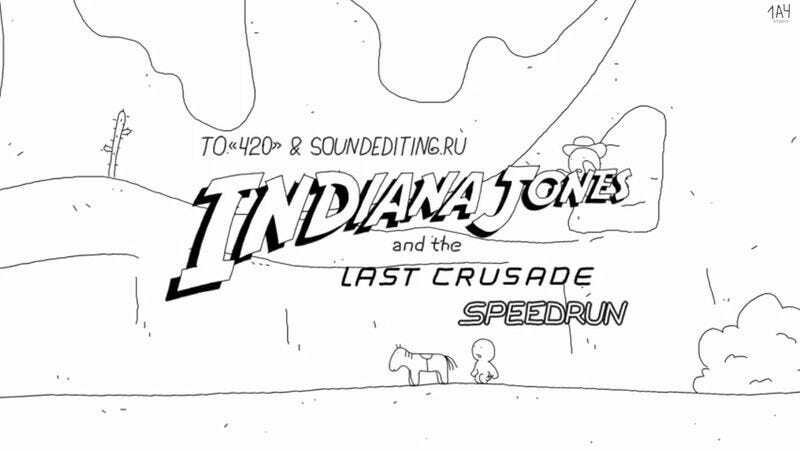 From the same strange Russian animation studio that created Speedrun: 2001 comes Indiana Jones And The Last Crusade: Speedrun, the latest in its series of 60-second animated adaptations of popular films. Who is 1A4 studios? And why do its voice-overs sound like foul-mouthed Minions? This is not for the viewer to expect answers to (a Facebook profile helpfully explains 1A4 are “instrumentet animation studio njohur for her work and advertising eshte animated seri assessment”). But what the creators’ Last Crusade speedrun lacks in the charms of the 1989 classic it’s adapting, it makes up for in frenetic energy and lowbrow humor–which, while embarrassing, is still less cringe-worthy than Indiana Jones And The Kingdom Of The Crystal Skull. And unlike Crystal Skull, it’s perfectly watchable with the sound off.